Callisto offers a choice of powered bookshelf and tower speakers. Unlike other wireless speakers, these are true audiophile DALI designs with built-in amplifiers for convenience, setup, and ease of use. 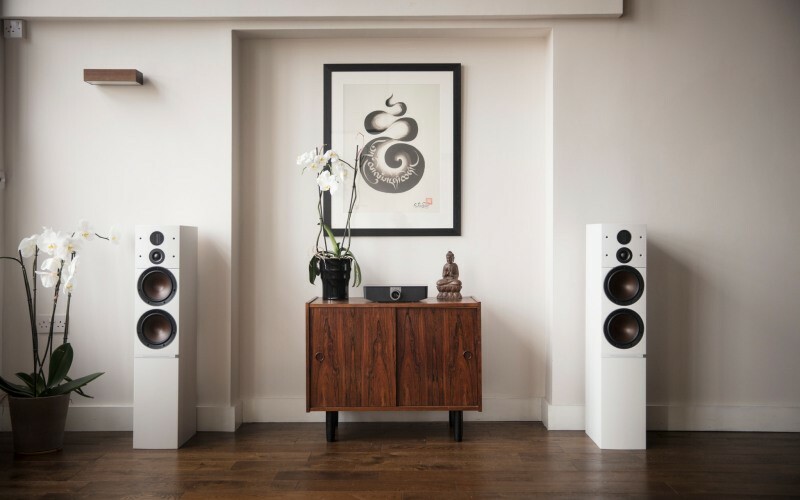 The Callisto speakers connect wirelessly to the DALI Sound Hub, which features a variety of wireless and wired connections for compatibility with a wide array of audio sources. The wired connections feature HDMI connectivity for audio from a TV, CD, or Blu-Ray player. Optical and analog connectors allow for a turntable and other music sources. For convenience, these connectors can turn the hub on and switch to the right input when a signal is detected. But these connections are not what makes the DALI Hub and Callisto unique. In keeping with the wireless architecture, the speakers connect to the hub over a high-resolution wireless connection. Since the speakers are powered, they don’t require separate amplifiers, and therefore no speaker wires run to them. The wireless connectivity allows flexibility in speaker placement without unsightly speaker wiring. The Sound Hub also features high-quality Bluetooth streaming with Apt-X and AAC, which are the latest and best Bluetooth technologies to derive the best audio quality from Apple and Android devices. The hub also features compatibility with BluOS, a high-resolution wireless audio ecosystem supported by several audiophile vendors, allowing the system access to high-resolution local and Internet streaming sources. It is compatible with BluOS multiroom systems for synchronized wireless whole-home music, and all of this capability is controlled via the BluOS app on a smartphone, tablet, or the included Bluetooth remote. Beyond the wireless capabilities, the speakers themselves feature the engineering and build quality for which DALI is known. The speakers employ DALI’s wood fiber cones and patented SMC driver technology which reduces distortion. DALI’s trademark hybrid tweeter combines both dome and ribbon tweeters for incredible high-frequency performance. The Class D amplifier built into the speaker is capable of delivering 300 watts of peak power when necessary. More importantly, the amp is perfectly matched to the drivers and optimized for this system. The result of this reimagined audiophile system? Brilliant sound with superb convenience. No fussing with separate components, matching amplifiers to speakers, or other complexities. The BluOS ecosystem brings high-quality wireless audio sources and compatible equipment together, and operating this hi-fi system is as easy as your smartphone. Are you ready for high-end wireless audio in your Vancouver, WA home? Reach out to our team today!